I’ve been hunting almost daily since the beginning of deer season. I have seen a lot of deer, but not a buck I wish to tag within range. That’s OK because I really enjoy watching and learning from deer. I hunt in the Ozark Mountains in southern Missouri. The rut peaks (biggest number of does receptive at one time) here during the next two weeks. My observations and strategies will apply to folks that hunt where the rut is on the same timeframe. I realize deer have finished rutting at some locations and are not close to starting at other locations. 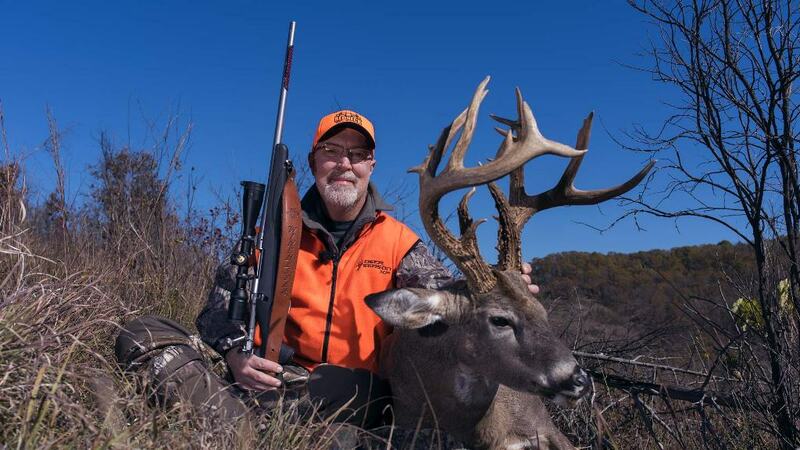 However, throughout the majority of the whitetail’s range the rut will peak during the next two weeks. Based on those observations I’ll share my hunting strategies for the next few days. Bucks are still using scrapes, especially along travel corridors. Bucks aren’t using scrapes on the edges of fields and food plots as much. This is because they are focused on seeking receptive does rather than feeding during this stage of the rut. Most bucks, especially mature bucks, are not on a food cover pattern. Where any buck will be is very tough to predict during this week because their pattern can change in an instant if they detect a receptive doe. I will be bow hunting today; tomorrow firearms season opens in Missouri. So, my strategy today will be much different than tomorrow. Today I will seek stands in known travel corridors. Those are difficult to find in the mountain habitat that I hunt because it’s 90+ percent timber and cover. It’s much easier to find travel corridors and bottlenecks in ag country where cover is limited and bottlenecks are easy to find by simply studying aerial images. Tomorrow I’ll be carrying my Winchester and my odds will be best where I can use its effective range. At my place that means watching powerline easements or large areas where there is native grass rather than timber. Utility easements, or other long linear openings, offer hunters a view into cover without disturbing deer. I simply approach from the downwind side and pick a spot where I think or know deer are crossing. This is an excellent stand/blind location for hunting and learning where deer prefer to travel (travel corridors!). It seems receptive does will often seek thick cover when they are receptive to avoid being pestered by multiple bucks. Years ago, I cut all the cedars on a 25+ acre hillside and used prescribed fire to encourage native grasses and forbs to grow. Native grasses provide deer great cover but due to the slope I can see into the cover over most of the hillside. This is perfect. The deer are extremely comfortable in this habitat and I can observe them. Through the years I have watched bucks tend many receptive does in that area. I placed a Redneck Blind overlooking this area and have tagged many bucks from it. That’s likely where I’ll be hunting tomorrow morning. I’ll keep you posted on our social media. I hope these strategies help and that you enjoy Creation!